Heatherwick Studio's The Vessel at Hudson Yards. Image: Related Companies/Oxford Properties Group. In his long read for The New Yorker, Ian Parker tells the story of New York's (potential) new Eiffel Tower, the Vessel at Hudson Yards, and profiles the British designer behind this and many other ambitious structures, Thomas Heatherwick. It's a symbol of money and a place that requires something to enter. At the very least you need to have status, fitness, perhaps something more after that. I'm sure the list will grow over time. Really it's just another status quo project with a status quo mindset. That is absolutely annoying. Not surprising though. What else could such a location endure to have placed there? It's like the absolutely incomprehensible garden by the bay in Singapore. It is impossible to deny it exists but I cannot for the life of me figure out why it is there. That said, I can bet that I would enjoy visiting it, just like all of Heatherwick's projects. Unless I had to pay to enter, which is the case for most of his work come to think of it. It is creative enough though. Credit should be given where it is due. 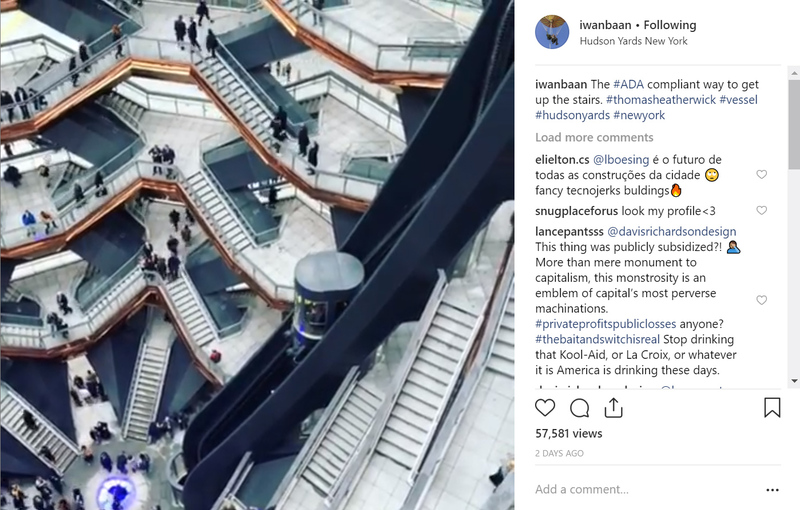 I agree with Bjarke there is something in Heatherwick's work that is willfully out of synch with what architects are taught about aesthetics and design that I definitely support. Seems to me this was the worst dragging of a designer I've seen in the New York Times. Shade everywhere. The New Yorker is not the New York Times. I couldn't get through the article, the whole project bores me too much. But if someone who did read it doesn't mind telling me: did the question of ADA ever come up? Thank you! Its not a utilitarian public structure. By your logic we should tear down mountains and hiking trails because some cant climb them. Oh, are mountains and wilderness areas through which hiking trails go man-made? The fact that it doesn't meet ADA is just one of many problems I have with it, the main problem being that it bores me so much I can't figure out why it also annoys me so much. I thought in a previous news post threadkilla noted "Luckily, for those unable to make the full trek, there will also be an elevator offering access to the top."? Has something changed since then? Or does that not address all your ADA concerns, Donna? Theme park rides, hiking trails, indoor rock climbing, trampoline parks, playground equipment, etc...all have physical requirements. Just saying, don’t feel there is a requirement to make this ada accessible...it would be nice, but would kinda negate to point of the project. I think this project is very boring though...and Heatherwick is overrated like most celebrities. He's not the most creative person but maybe the most successful creative person of recent times, although with all those projects being scrapped recently maybe not even that. 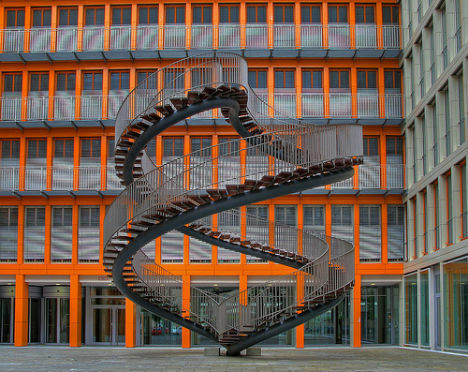 There have been soooo many stair sculptures out there, I really don't get all the excitement about Heatherwick's. Maybe it's because Americans in general never use the stairs? For the record, this is the same paper trumpeting (no pun intended) Russian election interference. Remember when Russia hacked Hillary and the DNC? 15 months later they charge some Russian civs for buying ads on FB. The Dems have just committed mass suicide. All they've got is they're not Trump. All Trump had was that he wasn't Hillary. Anyway, paying any attention at all to this soy-printed toilet paper is a complete waste of time. 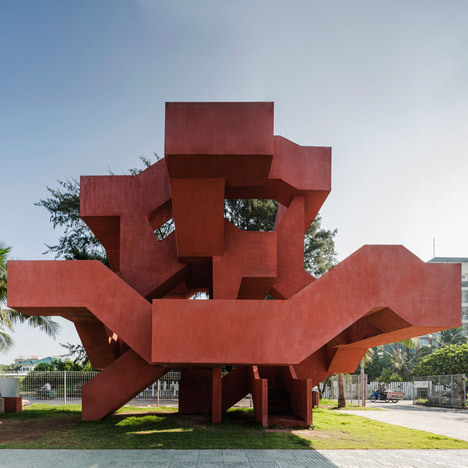 It seems like the architectural community has finally made a lumbering pivot in the general direction of equity and teamwork, and away from the genius starchitect as the sole author of great works. But this piece seems out of touch with that movement - or anything else happening in the world for that matter -and instead offers us a unsurprising glimpse into the rhelm of privilege. A young white man's struggle to overcome his "evil professor". If only more women and students of color studying design had the savy to merely shake hands with a famous person (Conran) ,and they too could be invited to live in said persons house and maybe even become world renown. Great response, Will. I would have Featured it if someone else hadn't beat me to it! And yes, you nailed so many of the reasons why it's annoying. Let me just say that this guy comes up with some truly interesting concepts. That he actually gets them built is more a study in privilege and connections than anything, but that isn't a reason to begrudge the projects (there are plenty others). That said, I visited this site a few weeks ago and it is completely underwhelming. The piece has no room to breath (I'm approaching it as a sculpture, not a building). It's wedged right in between DS+R's shed and a couple totally schizophrenic KPF towers. A triumph in poor site design and placement. The top of the structure is level with the top of the High Line (more or less) and there are much better views to be had from there. As a sculptural object, it's beautiful and compelling. As a visitor attraction or site-specific sculpture, it is (and will be) totally disappointing. I do agree with you, archanonymous, that Heatherwick has done interesting stuff. I love that original unrolling bridge, and I desire to own the Spun chair myself ever since I sat in one the first time. It's wonderful. But this stair thing leaves me cold. This is an ugly, self-serving pile of poop. The color matches too! turns out this thing DOES have an ADA compliant elevator. watch the video on iwan baan's instagram. The "article" (really just a thinly veiled sales promotion) is as almost as ostentatious and obnoxious as the development itself.